Making farinata was a revelation. I discovered that it’s completely delicious – and incredibly moreish. I’ve heard about it, tried one version, and seen a few recipes, but it’s not widely known and it’s not a food that people talk about. And when you look at a recipe for a farinata, you don’t immediately think, ‘Oh, that will be lovely’. I assumed it would just taste of gram flour as it’s just a mixture of the gram flour (chickpea flour), olive oil, salt and water. But it doesn’t. Somehow, the quantities of olive oil and salt combine with the flour to produce a completely different taste. And it is truly delicious! I’ve made it here with sparkling water and I left it to ferment overnight, to create a light, airy texture. And I’ve added a porcini, olive and sage topping (you could use any dried mushroom) to create a rich, earthy vegetarian dish that’s perfect for a lunch at home or even to take with you to the office or in a lunchbox. To make the farinata dough, sift the flour and salt into a large mixing bowl. Add the oil and the sparkling water and beat gently with a whisk to draw the flour in to make a smooth batter. Cover with cling film and leave for at least 4 hours, preferably overnight. Preheat the oven to 220°C/425°F/Gas 7. 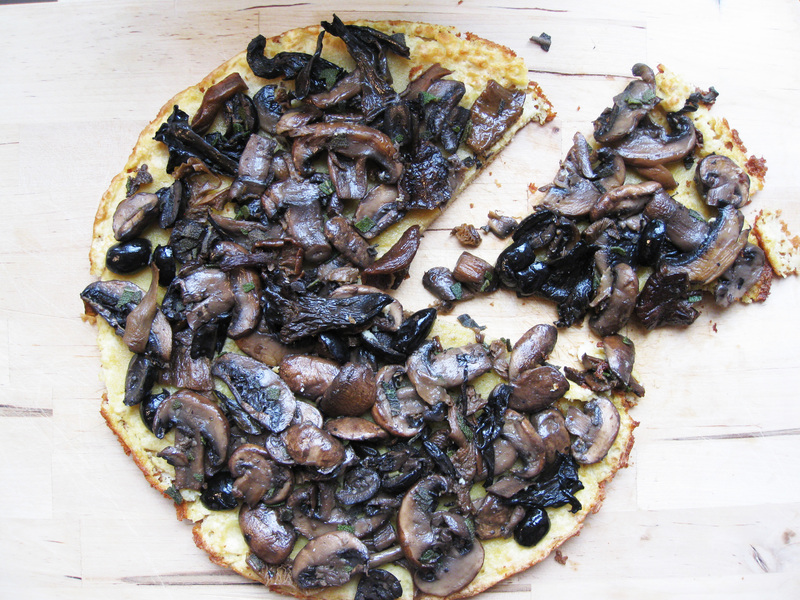 To make the topping, put the dried mushrooms and 250ml/9fl oz/1 cup water in a bowl and leave to soak for 20 minutes. Strain through a sieve into a clean bowl and reserve the liquid. Heat 2 tablespoons of the oil in a large, heavy-based ovenproof frying pan until hot. Whisk the batter lightly then pour half of the mixture into the pan, turning the pan as you pour to coat the bottom of the pan evenly. Bake in the oven for 15–20 minutes, until the farinata has set and the edges are slightly crispy. Remove from the oven and, using a spatula, turn the farinata out onto a serving plate and keep warm. Repeat with the remaining mixture, making sure you whisk the batter again lightly before pouring into the pan. Meanwhile, heat the remaining two tablespoons of the oil in a large, heavy-based saucepan over a medium heat. Add the fresh mushrooms and fry, stirring occasionally, for about 5 minutes, until tender and lightly browned. Add the garlic and fry for a further 30 seconds, stirring constantly. Then add the strained mushrooms, mushroom liquid, olives and sage, and season lightly with salt and pepper. Bring to the boil, then turn the heat down to low. Leave to simmer for another 5 minutes, until the liquid has been soaked up or evaporated. Spread the mushroom and olive mixture over the farrinatas and serve warm. Peter, Zoё and I went to Saf Restaurant Kensington recently. Located on the first floor of Whole Foods, Kensington, this “Botanical Fine-Dining Restaurant” serves up delicious, contemporary raw and vegan food, next to the other food outlets. Ever since I went to Saf in Old Street with a friend, I’ve been a huge fan. 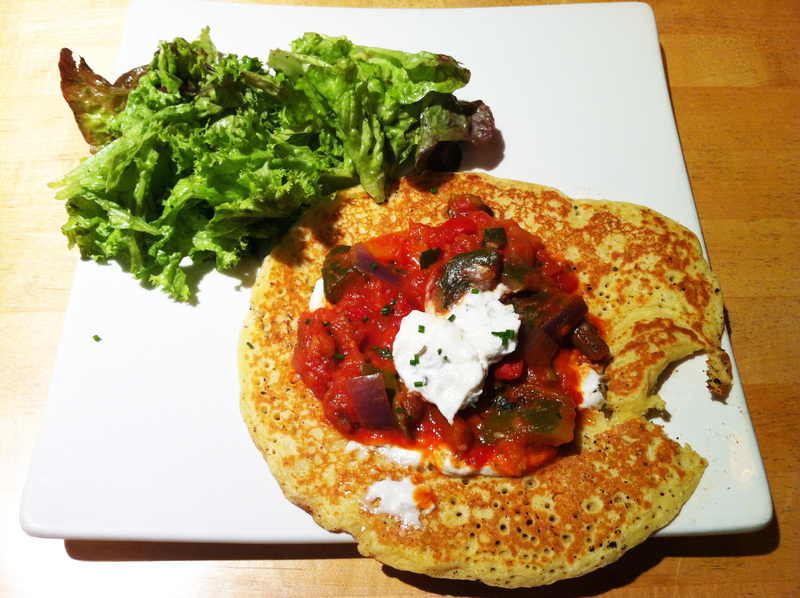 I’ve been to the Kensington branch, too, and this time I took Peter and Zoё. I knew that Peter would like the food but I hadn’t realised how much Zoё would, too! We had a truly delicious meal – full of wonderful flavours and textures, which is a real feat for a restaurant that produces many of the meals as raw food. We started with the raw, gluten-free Pesto au Poivre (basil pesto between layers of their signature cashew cheese with a dehydrated pink peppercorn crust, served with rocket salad, raw flax seed crackers and drizzled with balsamic glaze) and raw, gluten-free Dolmades (vine leaves filled with cauliflower rice, pine nuts, cumink, lemon juice and dill served with vegan yogurt and cucumber dip). 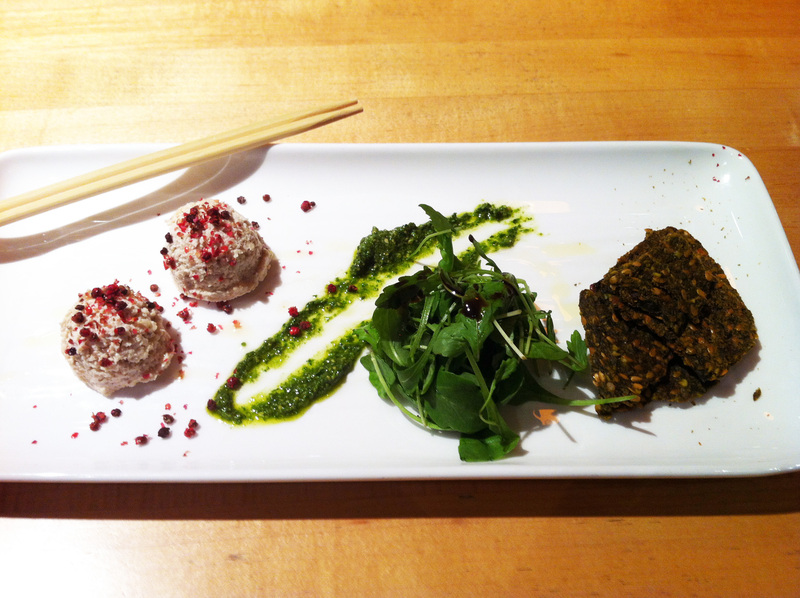 The Pesto au Poivre was awesome – bright colours, and a delicious combination of flavours. 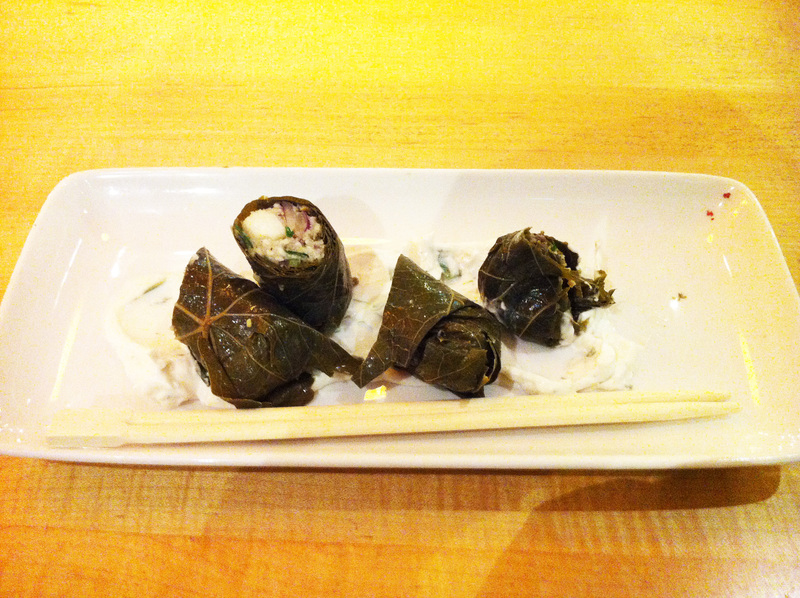 And the Dolmades was lovely, too. Cauliflower rice is one of those things that has to be tried to be believed – because it really does taste great. 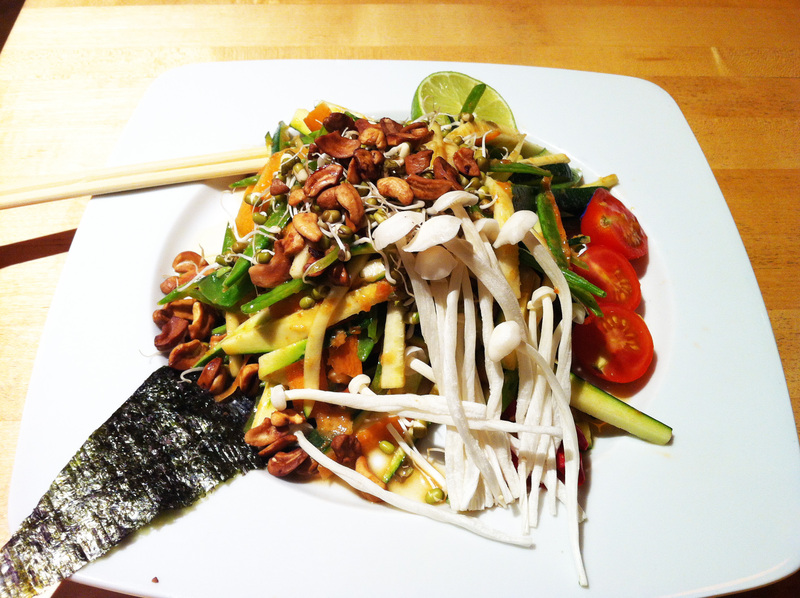 Then we had the iconic raw, gluten-free Saf Pad Thai (carrot, courgette and mangetout noodles, sprouted lentils, mung bean, enoki mushrooms, spicy cashews, tossed in their chipotle almond sauce topped with fresh coriander and chilies) and gluten-free Slow Roasted Vegetable Farinata (slow roasted peppers, courgette and tomatoes in a chickpea farinata crêpe served with lemon-tarragon aioli and salad). The Pad Thai was as amazing as it always is – full of vivid colours and flavours, and the Farinata was a lovely comfort-food recipe, with a delicious edge from the aioli. 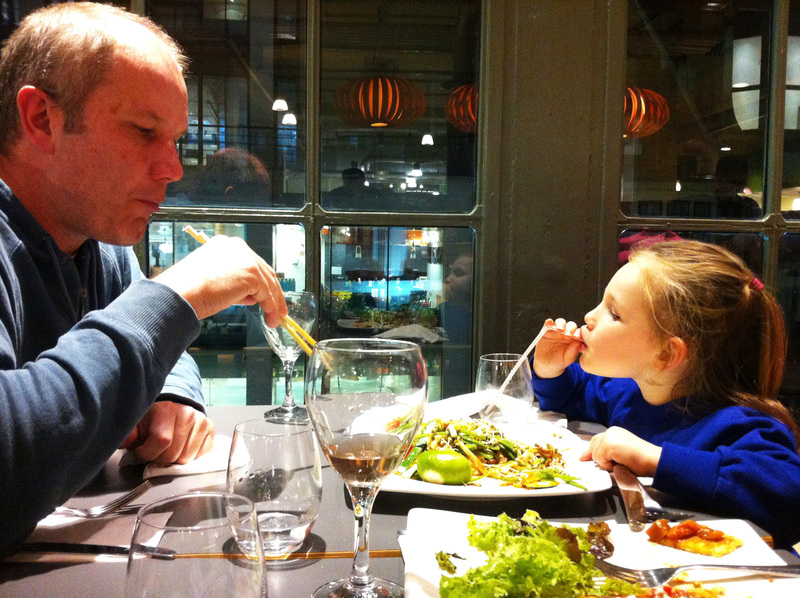 The really wonderful thing, though, was how much Zoё enjoyed the meal. 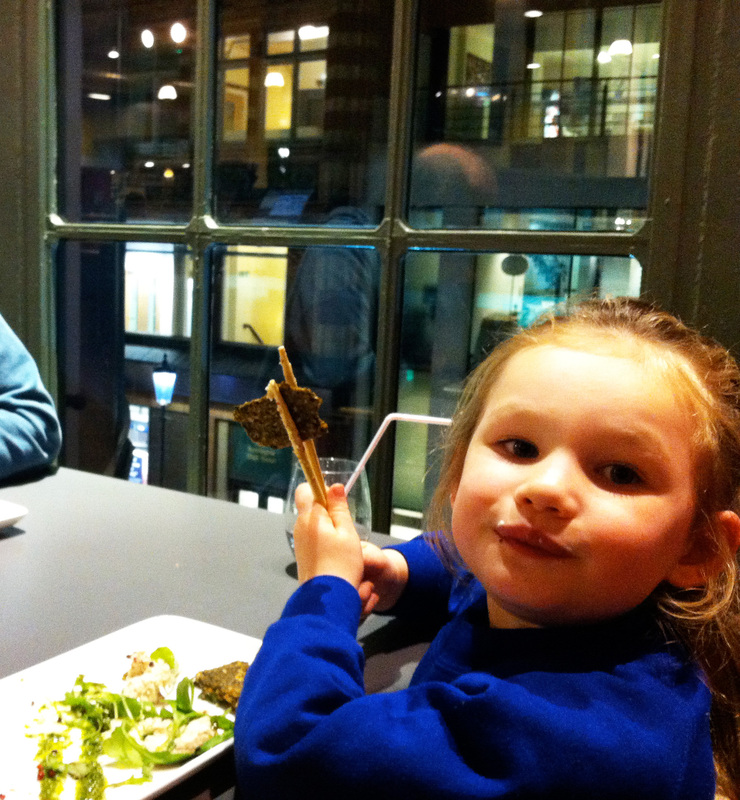 She does like things like sushi, seaweed, veggies, nuts and salad. But she also loves things like chips and tomato ketchup, so this wasn’t a foregone conclusion, by any means. But she helped herself to my flax seed crackers, to Peter’s nori and then nabbed his plate of Pad Thai and sat happily trying everything. I’m sure the beautiful colours in the dishes made them enticing, but perhaps this shows that you don’t have to be a raw/vegan food fan to enjoy this food – that literally everyone can! Recently I worked with Beverly le Blanc on her brilliant new book, I Love My Slow Cooker, which was published last month. She very kindly gave me one of the slow cookers she’d bought to do all the testing and didn’t need any longer (many thanks, Bev!!) so I’ve been having a lovely time trying out lots of the recipes from her book. My mother didn’t have a slow cooker, and I’d never tried one before, so it was all new to me. But oh wow, are slow cookers great! What you probably haven’t heard is how slow cookers are wonderful for making a whole variety of dishes. Yes, of course, soups, stews and sauces. They’re great, too, for cheap cuts of meat (which you can cook for numerous hours until meltingly tender) and dried beans (which you can leave to bubble away without worrying about them going mushy). But they’re also brilliant for cooking fish. Whether you’re cooking a fish stew fairly quickly, or cooking something like squid on a low heat over several hours, you’ll find that the fish cooks perfectly and doesn’t overcook. And what’s more, the slow, gentle, steam cooking can create superb puddings, too. No need to mess about doing a bain-marie method – you can just put it in a slow cooker. I have some firm favourites already from this book. And one of them is this Asian-Style Poached Chicken & Pak Choi. I’ve adapted the recipe slightly so that it’s completely gluten-free and dairy-free. But basically, you put a whole chicken in the slow cooker, add the Asian-style ingredients, and 4 hours later it’s bubbling away, ready to be served. I serve it with coconut rice because Zoё loves that (I do equal parts coconut milk and water and a few coriander leaves in at the end) and often add more veggies to the pot. It’s a lovely family meal but it also gets lots of oohs and aahs when people come round. Put an upturned heatproof saucer in the slow cooker. (Check that the chicken will be able to sit on top of the saucer with the cooker lid in place.) Preheat the covered cooker on HIGH. Put the coriander and halved onion in the chicken’s cavity and season with pepper. Secure the opening with wooden cocktail sticks. Put the chicken in the cooker, breast-side down, then pour over the stock, tamari and rice wine. Add extra stock to fill the container, if necessary, leaving a 2.5cm/1in gap at the top of the pot. The chicken will not be completely covered with liquid. Push the sliced onion, garlic, galangal and chilli into the liquid. Cover the cooker with the lid. Cook on HIGH for 3¾ hours until the juices from the chicken run clear when the thickest part of the meat is pierced with the tip of a sharp knife or skewer. Remove the chicken from the cooker, wrap in foil and leave to rest for about 10 minutes. Meanwhile, put the spring onions and pak choi in the cooker, re-cover and cook for a further 20 minutes until the pak choi is tender. Remove the pak choi from the cooker, and wrap in the foil with the chicken. Pour the cooking liquid into a saucepan and bring to the boil, then boil vigorously for at least 3 minutes until reduced. Add a little more tamari and pepper, if you like. Remove the skin from the chicken and carve. Strain the cooking liquid, discarding the solids. 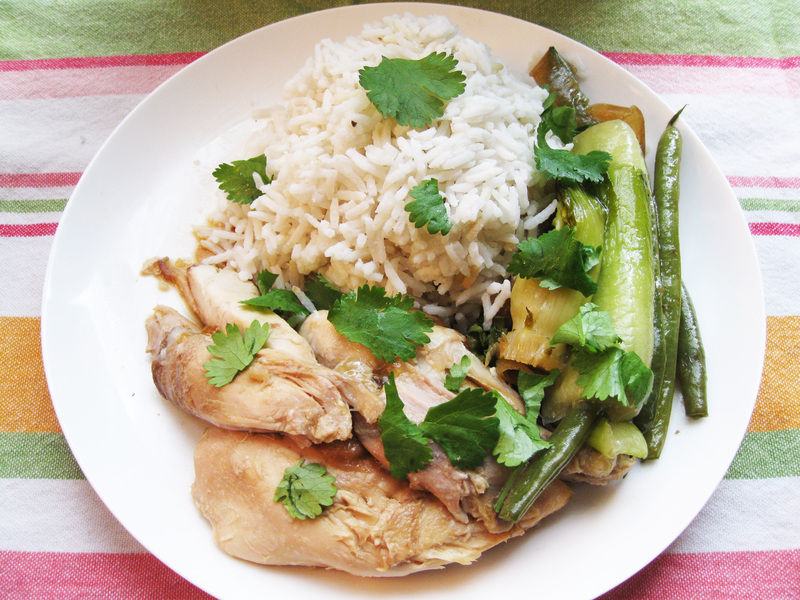 Sprinkle the chicken with coriander and serve with the cooking liquid, pak choi and rice. I’ve just spent a wonderful week off work – at home hanging out with Peter and Zoë, and with friends – and cooking an array of meals. Ahhh…. One of the meals I cooked was the Roast Pork Loin from Johnnie Mountain’s book, Pig, (he’s the guys who’s starring on Chef Wars in the US at the moment, and who punched the wall and walked out of Great British Menu in the summer). Pork is having a well-deserved revival at the moment. It’s a meat that has a wonderful diversity of textures and flavours. It’s economical and healthy. And now that it is reared hygienically, you can cook fresh pork so that it’s still pink in the middle, so no need to eat tough, rubbery pork any longer. Johnnie’s books is full of completely delicious recipes, and you can also learn how to smoke your own pork and even make your own sausages and bacon. What’s more, there’s an added bonus of links to videos of Johnnie showing you how to do various techniques. Johnnie signed a copy of the book for me with the inscription ‘There is only one Grace Cheetham’ but I think the truth is that there’s really only one Johnnie Mountain! 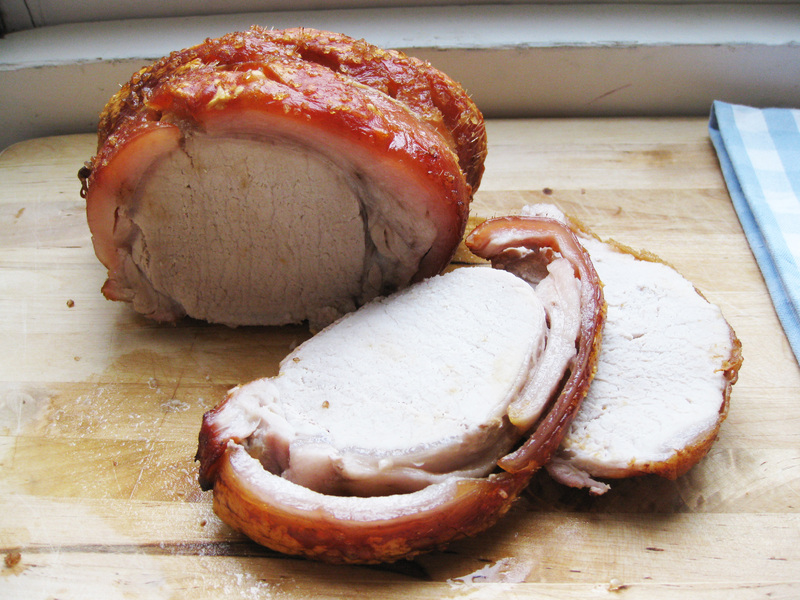 ‘You may feel that a roast needs lots of care and attention and, therefore, should only be cooked for Sunday lunch, but in reality a roast loin of pork is one of the easiest things to cook and pretty much looks after itself in the oven. This is thanks to a combination of a lean eye of meat surrounded by a moderate amount of fat. The fat melts away during roasting to keep the meat moist and gives a crisp outer rind or crackling. A small joint can easily be cooked for a midweek dinner, or a large joint, perhaps a rack of pork on the bone for dramatic effect, can be served for a special occasion. The basic principle of roasting a loin of pork with perfect crackling is that the joint is given an initial blast in a very hot oven to heat and blister the skin, setting it on its way to golden crispness. The oven temperature is then turned down to allow the meat to cook more gently. Pork doesn’t need to be roasted for a long period of time, in fact it can be served slightly pink and is juicier and better for it. 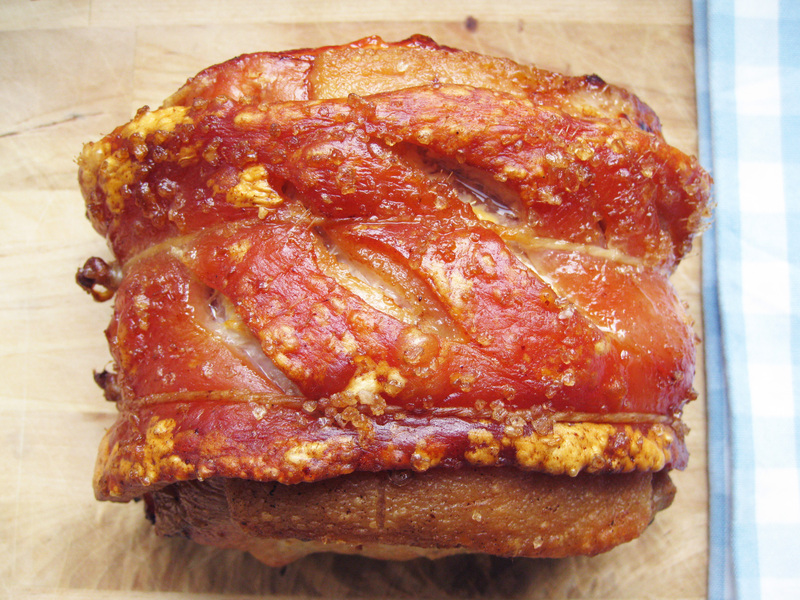 The crowning glory of roast pork is the crisp crackling, the part that people fight over! To create perfect crackling is fairly straightforward, and a little touch of TLC before cooking will avoid a flabby rind. Moisture is the main enemy, as the pork skin will steam rather than crisp. If you do have the time, then leave the joint of pork in an uncovered dish in the bottom of the fridge for a day, making sure that the raw meat does not come into contact with anything else. Alternatively, use kitchen paper to thoroughly pat the skin dry, or you could even give it a little blow dry with a hairdryer on a cold setting! Next, make sure that the skin has been properly scored (if you have a butcher, ask him or her to do this for you). Although supermarkets tend to sell pork joints with the skin already scored, it usually isn’t cut deeply enough to get really great crackling. If preparing the skin yourself, use a sharp, thin blade, such as a Stanley knife or craft knife, to make long cuts into the rind; only cut into the fat and not the flesh. Make sure the cuts run parallel to each other and are spaced 3–5mm/¹⁄8–¹⁄4in apart. Scoring will give space for the fat to bubble up, basting the skin and meat. Just before cooking, rub in a little flavourless vegetable oil and season generously with coarse salt and freshly ground black pepper. The oil will help the salt to stick to the skin and the salt will draw out any moisture still on the surface; any excess salt can always be brushed off after cooking. Preheat the oven to 240°C/475°F/Gas 8 and line the roasting tin with foil. Prepare the pork by drying the skin thoroughly, patting it with kitchen paper. Using a sharp knife, score the skin, making deep, long parallel cuts into the fat about 3–5mm/¹⁄8–¼in apart; do not cut into the flesh. Rub the skin with a little oil, then season it with a generous amount of coarse salt and a little pepper. Sit the pork on a rack over the roasting tin and roast for 25 minutes. The initial high temperature helps to give a crisp crackling. Turn the oven down to 180°C/350°F/Gas 4 and cook the pork for a further 45 minutes, turning the tin around halfway through. The meat should be slightly pink in the centre, though the juices flowing from the pork should not be bloody. If you have a meat thermometer, it should read 63°C/145°F. Transfer the pork to a warm serving plate and leave to rest in a warm, draught-free place for 10–20 minutes before carving. Don’t cover the joint, because any steam coming from the resting pork could soften the crackling. You could remove the crackling at this point and return it to the oven turned up to 220°C/425°F/Gas 7, or give it a quick blast under a hot grill to make it extra crispy. To carve the pork, remove the crackling, if you haven’t already done so, and cut it into strips. Carve the meat across the grain into thin slices. You may need to adjust the cooking times at the 180°C/350°F/Gas 4 stage, depending on the weight of the pork joint. Allow 25 minutes per 500g/22 minutes per lb. If you like your pork more well done, cook for 30 minutes for 500g/27 minutes per lb. For a rack of pork on the bone, aim for a 2kg/4lb 8oz piece of meat to serve 4 people. Roast for 25 minutes at 240°C/475°F/Gas 8, then turn the heat down to 180°C/350°F/Gas 4 and cook for 20 minutes per 500g/18 minutes per lb. And here comes the bonus! If you click on this link, you’ll go to footage of Johnnie showing how to do this recipe. Fantastic!